wheel (try that in an automobile!). We watched videos, read the NASA white papers, and even studied their patents. The key to the suspension system was the configuration of the wheels, the multi-jointed swiveling chassis, and a special counter-rotating differential that we built. Mars Rovers also have a very unique way of turning: they use servos to rotate the wheels at each corner 45 degrees, then spin to the desired heading. And, of course, Spirit II is solar powered like the original. Although it was difficult, in the end, we are very pleased with how Spirit II turned out. Enjoy the pictures and video below. Here we are working on one side of the rocker-bogie suspension system. Here we’re working on the counter-rotating differential and how it connects to the rocker-bogie suspension system. When the robot rolls a front wheel over a large rock, the suspension system tilts upward. The differential turns the rotation in the opposite direction, thereby tilting the opposite side of the robot downward to make sure the robot’s center box stays steady and level. Here we have assembled the back half of the rocker-bogie suspension system. The Counter Rotating Differential we designed and built for our Mars Rover. We’ve posted a new image that shows the electronics. Click on the photo to see the full-sized photo. We are writing you on behalf of Student Science Association of Kaunas University of Technology (Lithuania). We would like to invite you to participate in the international contest of robots “Robots’ Intellect 2012”. The event is being organized the second time in the Baltic States. This year contest will be held on May 3rd, 2012 in Kaunas University of Technology campus. The goal… of this competition is to motivate young people to take interest in high technology, artificial intelligence, robotics and other current topical areas of science and technology, as well as to try their personal skills and knowledge in creating their own robots. In 2011 no one won the jackpot “The Golden Sack” filled with 9000 Euros, so it was left to grow and wait for the competitors of 2012. MINI gold back is 500 Euros. The main task remains the same as the last year: a robot must find the golden sack on the special track with obstacles and fetch it to the start line. What is more, robots will have a chance to compete in other tasks, such as line tracking, labyrinth and others. Also, during this event, there will be robots’ exhibition, in which anyone, who has a robot, even the simplest one, can participate. If you are interested, don’t hesitate and register for this competition. For more information please visit our website http://www.robotsintellect.lt. We are looking forward to seeing you in the competition “Robots’ Intelligence 2012”, May 3rd, 2012. Amazing!!!! Me and my 5 year old love it. He told me the other day that he wanted to build a robot, i think i have just found something we can build. How did you make the wheel plates? Thanks, Alex. When you say you just found something you can build, do you mean the Spirit II or something else (if something else, let me know what it is). The round wheel plates come from the Pro section of Vex robotics. 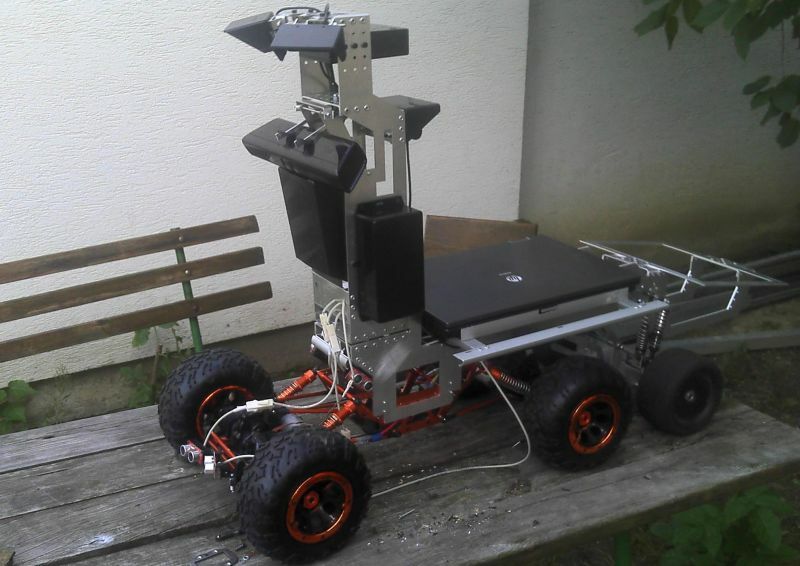 This is the most awesome hobby robot ever! I love the way you have done the differential in the middle. I had read the descriptions on NASA and Wikipedia sites, but couldn’t figure out how it worked! Your design is so simple and elegant. For the next year competition I’m building the rocker-bogie drive for it, but I’l make a little different approach. But your differential mechanism is very inspiring. I’m gonna have to make some modelling of it if it is usable in my robot too ( robot has to carry a 10kg off load and I’m not sure how robust I can create this mechanism ), otherwise I make some simple balancing mechanism on the front. On the tower there are 2 webcams to detect edge of road, then there is Kinect as obstacle detector. In the box up on the top there is gyro/ accelerometer/ compas. The crawler, as it turned out was a good choice for this app. It has great torque at low powerdraw ( it works for 2.5 hours on 7.2V 4.5Ah ). Only thing i was concerned about was the plastic parts of gearboxes, thats one of the reason why I want to change it to rocker-bogie. The other reason is that I always wanted to build a rocker bogie :). Btw, what torque (kg/cm) has those servos you used for steering? Your sensors sound excellent. Is working with the Kinect difficult? Do you have to use a programming environment like .Net or something? I started a new comment as it was getting too thin :). And Kinect SDK is .NET, especially for C#, and very easy to use. As I’m a java dev, it is quite enriching experience ;). In general Kinect works great – very stable. If I will be not able to find another thousand euros for Lidar, I’l buy another one of these to cover wider area ( kinect cover 62 degrees ). Thank you. We appreciate it. Yes, there is one Dimension Engineering Sabertooth 2 x 12 AMP motor controller. The three motors on the left side are wired together to the controller’s first channel. The three motors on the right side are wired to the second channel. Even though there are 6 motors, it’s not necessary to have three dual motor controllers. You only need one dual motor controller. The motors on a side operate in unison. In addition, there are four high-torque servos, one directly above each corner wheel, that will rotate the orientation of that particular wheel in order to set the wheels at forty five degree angles so that the robot will rotate in place around its center (this is how the NASA rover makes its turns. It actually rotates in place, then goes forward. You can see it doing this in the video). We programmed the Arduino to direct those servos through a tiny servo controller (a Pololu Maestro 6). Let us know if you need any more details than that. Matheus, Thank you for your positive comments. The Mars Rover took several months to build. The best place to start is to look at the detailed pictures on this site including links to the other pages (like the interior shots). Then check out all the companies/websites where we purchased the component parts (list at the bottom of the page). The part we’re most proud of is the rocker-bogie suspension system, which we made out of aluminum tubing. The more or less you spend? What you put down (in box) is counter-rotating differential rocker-bogie suspension system? I’m not sure I understand your latest question. The counter-rotating differential is the three bevel gears inside the box. Each set of three wheels (on each of the two sides) is attached to it via an aluminum shaft. The counter-rotating differential is part of the rocker-bogie suspension system (which is visible on the outside of the box as the legs, wheels, connecting tubes, etc.). CustomColor has always done me well no scrtached slides or negs, good prints, etc. I need some med format enlargements done, so I’ll have to pay them a visit in the new spot. Little known fact if you return the boxes that slides come in, they’ll give you $0.15 per box in cash. But where and how you connected all the wires? Vernon: The wheel components are from the pro section of Vex Robotics. sir i am very curious to know about the remote control system schematic diagram and as well as on board schematic diagram of mars rover spirit. Here is also image of whole rocker bogie – great thanx for inspiration. Hello again and thanks for your quick and detailed response to my earlier note. I’ve been reading the web sites you recommended (ServoCity et. al.) Great resources! Perhaps I can put off the mini mill purchase for another couple projects. 1. I’m curious about the Spirit II motor mount design process. Did you consider using a larger bracket that would allow positioning the vertical leg tube directly above the wheel axle? Just curious if this element was driven by aesthetics (similarity to NASA’s Spirit), function, or stock part availability. 2. The horizontal transmission shaft seems to be connected to the leg tubes by ServoCity 90 degree tube clamps secured on either side by a collar. The 90 degree tube clamps have a 1/2” bore and I understand the shaft is 3/8”. Can you describe how you connected the tube clamps to the shaft and prevented any rotational slippage? 3. Is the bracket that connects the middle and rear wheel assembly to the chassis down tube an off-the-shelf part or did you fabricate it? 4. Can you describe the components and design of the joint that allows the middle and rear wheel to pivot within the bracket? I can’t quite tell from the photos but it looks like it involves two 90 degree tube clamps pivoting on an axle. I’m curious about the spacers and bearings etc. used to make a pivoting joint. Thanks for taking the time to share your work with the rest of us. Much appreciated. 1. Putting the vertical leg directly above the wheel axle is a good idea and would eliminate the considerable moment-arm (right angle force) that is applied to that area with the current design. The reason we went with the current design is because we wanted it to look and function similar to real mars rover, and also, we were trying to use parts we could find. 3. Fabricated it. Tricky area. Take a look at the new Mars Rover. On that one, we used a ServoCity swivel hub (which didn’t exist when we built Spirt II). Very Cool ! Which type of antenna did you use for the Rover ?